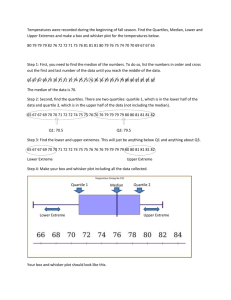 S.ID.1Represent data with plots on the real number line (dot plots, histograms, and box plots). and create box-and-whisker plots. Representation and interpretation are the major foci of this lesson. 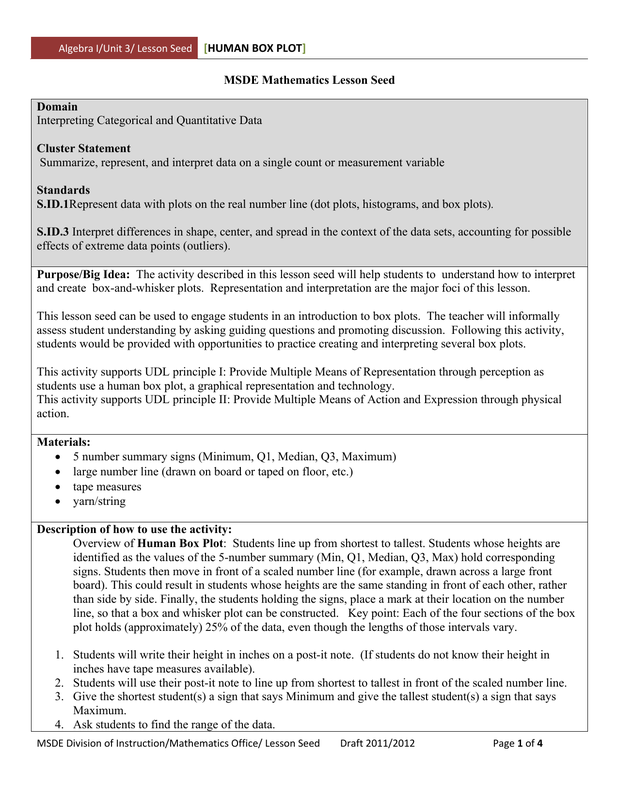 students would be provided with opportunities to practice creating and interpreting several box plots. 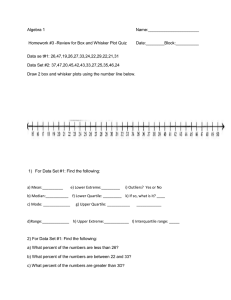 students use a human box plot, a graphical representation and technology. plot holds (approximately) 25% of the data, even though the lengths of those intervals vary. inches have tape measures available). 2. Students will use their post-it note to line up from shortest to tallest in front of the scaled number line. 4. 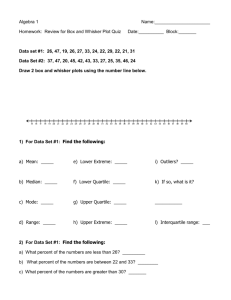 Ask students to find the range of the data. 5. Record the min, max, and range on the board. 6. Count total number of students. even number of students in the class, it will be necessary to average the two middle heights. 9. Instruct students on either side of the median to repeat step 7 in order to find Q1 andQ3. 12. Record QI and Q3 on the board. median would be Q2; however it is referred to as the median because of its importance. 14. We now have recorded the 5 number summary. 15. Provide a long piece of yarn to the student holding the “Q3” sign to keep in his/her hand. 16. Pass the yarn to the student holding the “Q1” sign. This student should hold the yarn with both hands. that includes all the students between Q1 and Q3. The data between Q1 and Q3 is in the “box”. Explain that they have made a human box-and-whisker plot. 20. 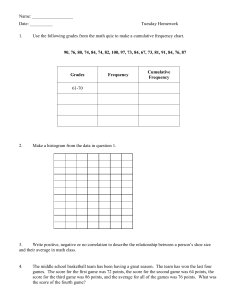 Use the attached template to decide on a scale and create paper versions of the human box plot. 21. Show a box-and-whisker plot with graphing calculator using the class data. • Where should you stand if you and another student have the same height? • How do we find the median if we have two people left in the middle? • Why do you think the median is called the 50th percentile? o Minimum and lower quartile (Q1)? 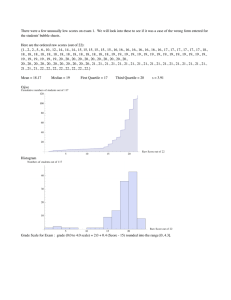 o Lower quartile(Q1) and median? o Median and upper quartile(Q3)? 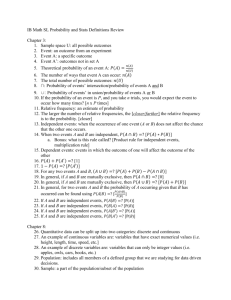 o Upper quartile(Q3) and the maximum? o Minimum and the maximum? o Lower quartile(Q1) and upper quartile(Q3)? 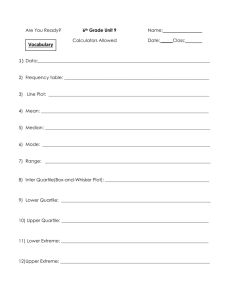 o Minimum and lower quartile(Q1)? and classify terms according to their meaning as a follow-up activity to assess understanding. • Post vocabulary words on a word wall for future reference. • Connect vocabulary terms with real-life experiences or to their Native Language(s). 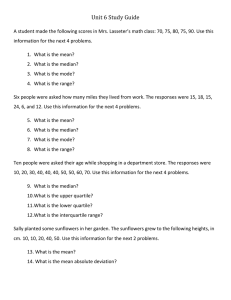 • Count out loud to find the median, Q1 and Q3 to help keep students organized. • Discuss the implication of outliers.